These guys might think they are good. They probably think they have it all covered. 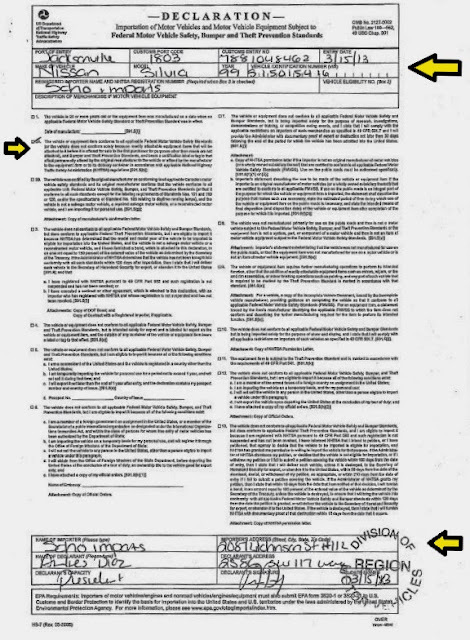 Most people wouldn't look twice at these official looking documents, but they are forged. Listed as being manufactured in 8/1999. Anyone that knows these cars, knows they were never imported to the US. On the HS7 form, SOHO Imports filled out box 2A. (b) The vehicle or equipment item conforms with all applicable safety standards (or the vehicle does not conform solely because readily attachable equipment items which will be attached to it before it is offered for sale to the first purchases for purposes other than resale are not attached), and bumper and theft prevention standards, and bears a certification label or tag to that effect permanently affixed by the original manufacturer to the vehicle, or by the manufacturer to the equipment item or its delivery container, in accordance with, as applicable, parts 541, 555, 567, 568, and 581, or 571 (for certain equipment items) of this chapter. Not true. 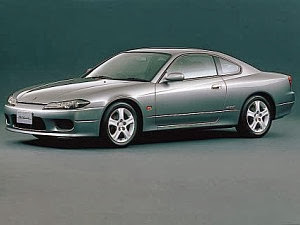 A S15 doesn't have a certification label. It was never certified for the US. This is a forged document. 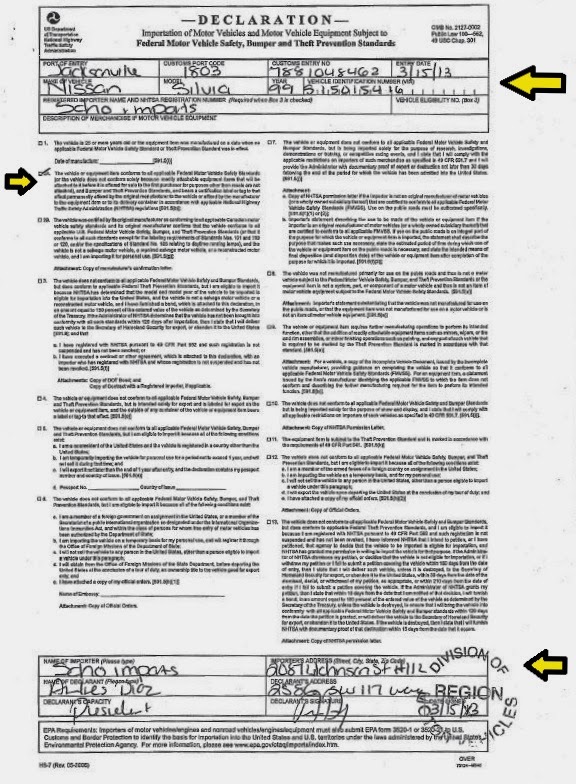 Still looking further at this document and matching it up to the EPA document - the 3520-1. Notice the entry date and the entry number. 3/15/13. Customs entry number - 7881048462 Customs Entry Port - 1803 Jacksonville. Then on the document is a stamp from the Florida DMV. No US Customs Entry stamp to be found anywhere. Why is there no entry stamp? Why is there a DMV stamp? Forged EPA document from SOHO for the same 1999 Nissan Silvia S15. S15-015416. Imported as a vehicle. Notice the entry date 3/11/13. 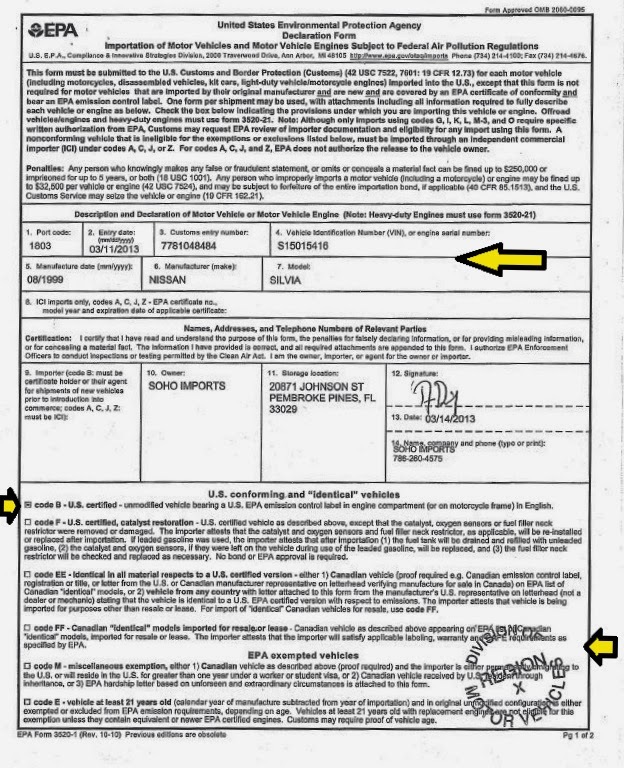 Notice the customs entry number 7781048484 Notice the port code 1803. 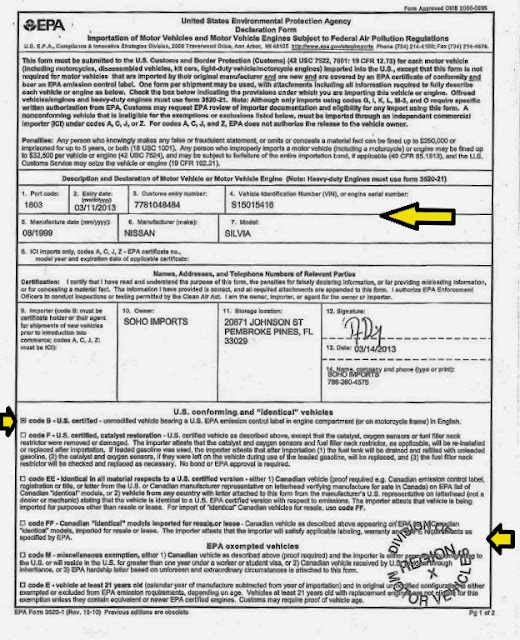 The document is filled in as code B, a US vehicle with a US emissions label. We know an S15 does not have this label, and it is not a legal car. Same DMV stamp from Region X in Florida. More shady importers based in Florida, doing shady things. Like some other guy now in Florida that had his illegally imported R33 seized, and is now trying to import 25 year old cars. Seems like you can't trust anything with a Florida title.